"The Super7 Masters of the Universe collection continues with the Ultimates Club Grayskull He-Man and Skeletor! 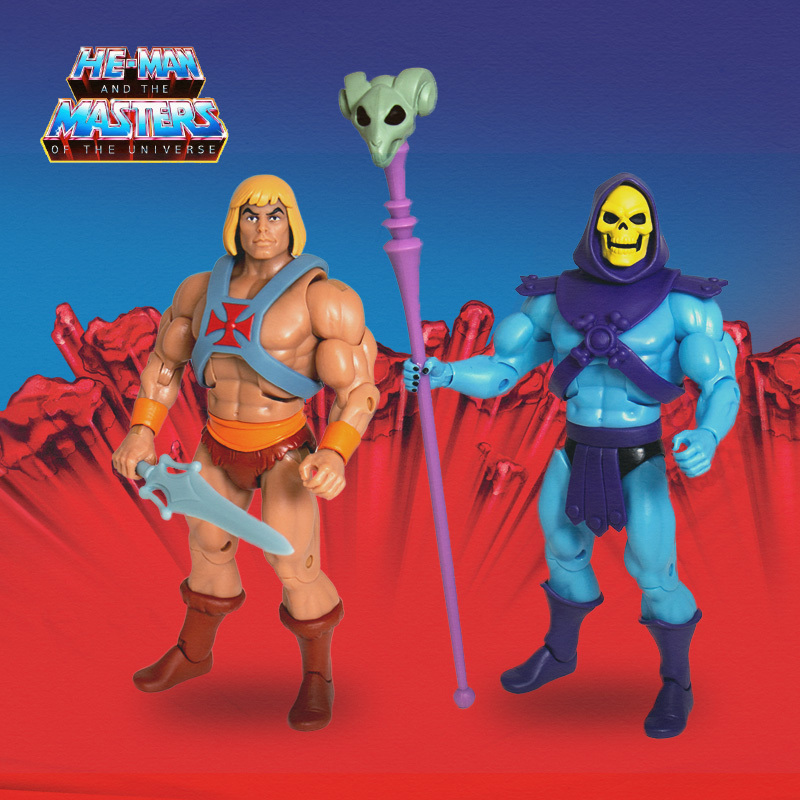 At last, the iconic hero and villain of the classic animated series He-Man and the Masters of the Universe return, now with all new accessories! 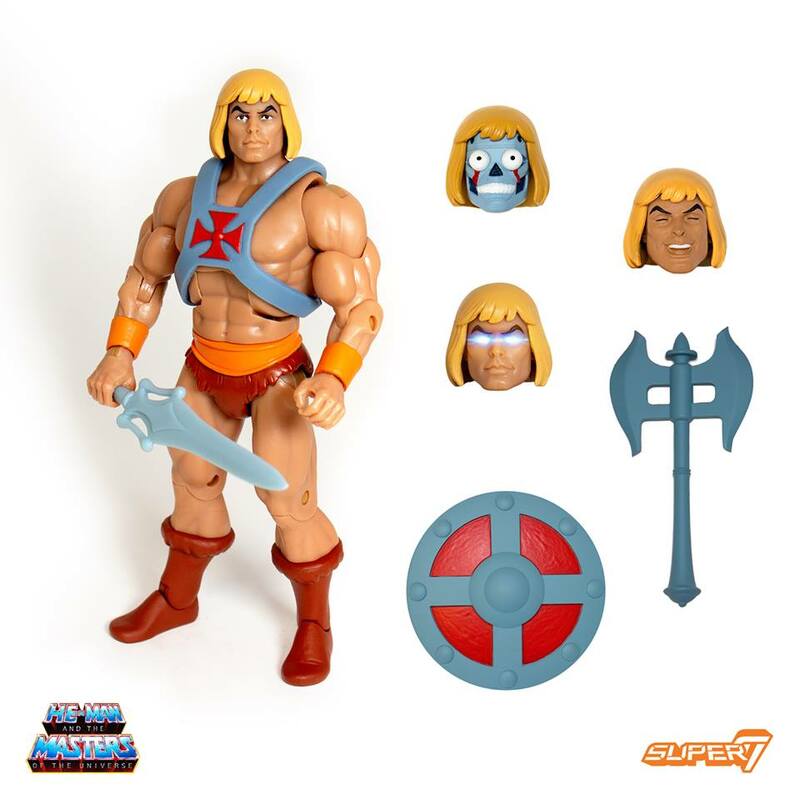 Mighty He-Man, the Most Powerful Man in the Universe, is packaged with Power Sword, Concept Art Battle Axe and Shield accessories, as well as three additional heads! Choose your own adventure by swapping between the heads of standard He-Man, Laughing He-Man, Robot He-Man, and Faker with glowing eyes. 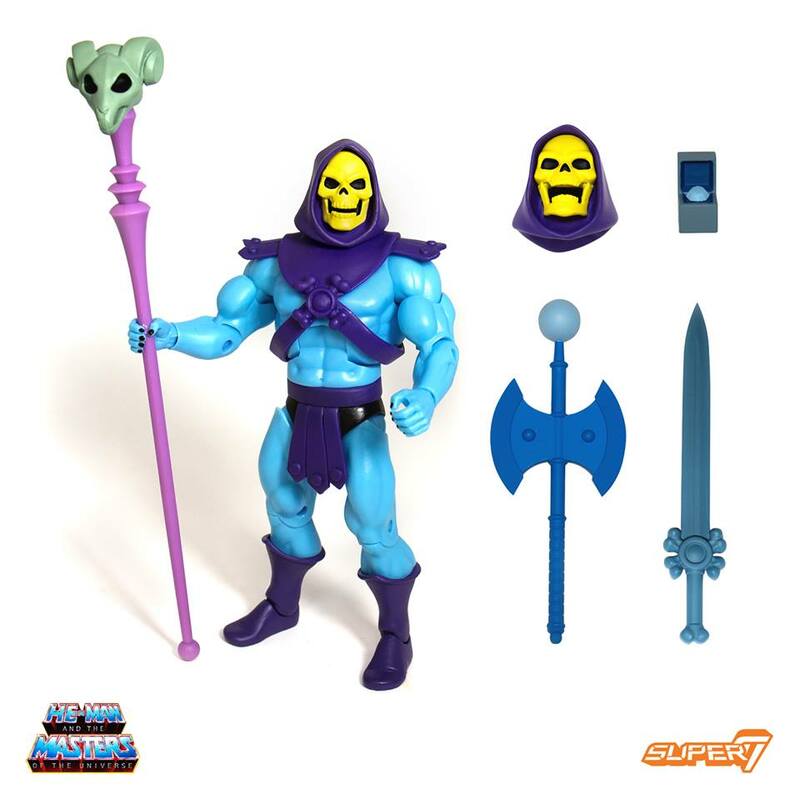 Evil Skeletor, Lord of Destruction, is packaged with Havoc Staff, Skeletor Sword, Skeletor Axe, and the Diamond Ray of Disappearance accessories. You can also re-enact Skeletor's mocking laughter with the additional Laughing Skeletor Head! The Masters of the Universe Ultimates Club Grayskull He-Man and Skeletor will be available for pre-order individually beginning next Monday, October 22nd 12noon PST through November 15th, 2018. $35 each plus shipping." On display at Super7's booth at NYCC 2018! Super7 are doing us proud! Amazing news!!! Check out those new ankles! Happy days! Hahaha i also just posted this thread. Would the mods delete or merge it? EDIT: No worries, I managed to delete it myself. So excited to see these. I think just recently I said in another thread. That I'd really love to get Filmation figure ULTIMATES. Since I missed out on He-Man and Skeletor when they first were released. · ToonJukka - Youtube Channel with He-Man/She-Ra videos; Origins, Trivia, Top5 lists and more! Good news for those who need them! "We must always value life, even the life of one who opposes us." - He-man, The Power of the Evil Horde (Mattel 1985). Can someone explain the purpose of the second Skeletor head? Featuring photos, bios, accessories, release dates, and trivia for every figure, beast, vehicle and playset released in Masters of the Universe Classics! you can never have too many Skeletor heads. Is that what we're supposed to be seeing? Surprised and angry? They look almost identical to me. Ah damn, 'better' versions of figures I already have. May have to sell the originals and get these, can't really afford to have both. Is that He-Man axe and shield from the show or just 'Filmation style'? Wish he came with a show accurate sword. Can't see any difference between those Skelly heads! I'm glad these are getting reissued, although He-Man's waxy face is concerning. The inside of Skeletor's hood could do with being painted this time. Would love if they could do that. I wasn't going to be the one to say it, lol. But yeah, his face looks weird, like the Power-Con Prince Adam did. Source on the He-Man axe, by the way, for those wondering. Concept art by Mark Taylor. Awesome. That's my Filmation Faker sorted and at non scalper prices. Happy days. I think the extra Skeletor head is smiling. The attached Skeletor head appears to be angry. 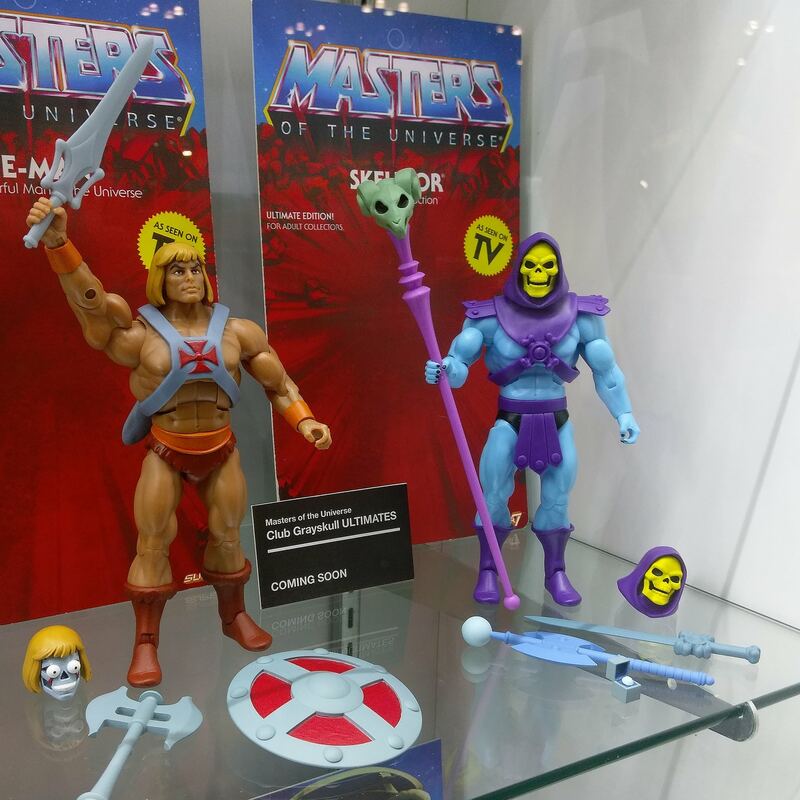 I have no concerns over these, with the continued improvements as the line progresses, this is the perfect time to release Ultimate versions of He-man & Skeletor. I pre-ordered the vintage style Robot He-man, but so pleased I can have the same in classics too. Plus, anyone who already owns Filmation He-man will have a spare torso for the Robot head! Win win!! i'm keeping my originals don't really see the need to upgrade, but good that they are issuing these for people that never got them. Skeletor, if there's a good bone in you, send help! There isn't! Never has been, never will be. please release accurate Filmation of-- , ram man, Leech, whiplash, entrapta , adora, moss man, buzz off, bow, frosta, catra, , webstor, count marzo, icer , mekaneck,Mermista, glimmer, Angela and perfuma. Now I don't have 2 spend $200 on Skeletor! I'm glad someone else thought the same! I wish one of the heads was in a thrown back laughing pose. If they came with a 2nd pair of boots so we could swap the originals over they would be even more ultimate! I might see about grabbing a set anyway. All times are GMT -4. The time now is 11:52pm.